Yesterday, I had a chance to check out the new Trader Sam's Grog Grotto at the Polynesian Resort. It is a very popular bar that serves unique and interesting drinks. The inside is pretty small, so it isn't easy to get a seat. However, there is a very nice patio outside called the Tiki Terrace. 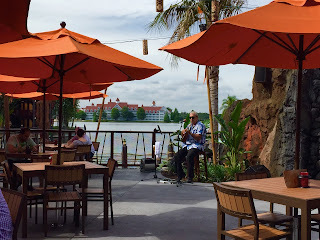 You can see the Hawaiian style singer entertaining guests, with the Grand Floridian Resort in the background.